Hundreds of commuters were stuck underground for nearly 3 hours last night, their hometime ruined by a power failure on the Jubilee Line. As usual, such bad news doesn't make it onto TfL's website but the BBC report that Blitz spirit prevailed with resigned passengers sharing food and seats while the unfortunate driver kept them up to date with... well, not very much really. Eventually, everybody had to be evacuated and led along the tunnel to the nearest station. And here's where we learn a new word - DETRAINMENT. Yes, in TfLspeak a detrainment process was undertaken. How perfectly detached and impersonal. We will no longer alight at stations. We will detrain. In further detrainment excitements, a DLR train derailed near Deptford this morning having hit an 'object'. Everyone detrained safely but the DLR is currently suspended between Greenwich and Lewisham. 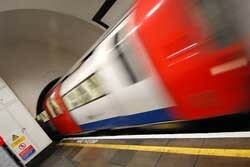 Check TfL's website for up to date travel news. And do let us know if you were on that hapless Tube last night - what was it really like?